Today, I hope you’ll bear with me as I get philosophical. (I promise not to get all “hippie college professor” on ya!) Think of this as one of Eddie Fitzgerald’s theory posts at Uncle Eddie’s Theory Corner. When an artist sits down to draw something, he is focused on how the object he is drawing appears. But there are other aspects that can be caught in a drawing beyond just the likeness. Believe it or not, it’s possible to also capture the place that object holds in the universe. We scanned an interesting and inspiring book today- Ernst Haeckel’s Die Natur als Kunstlerin (Nature as Artist). 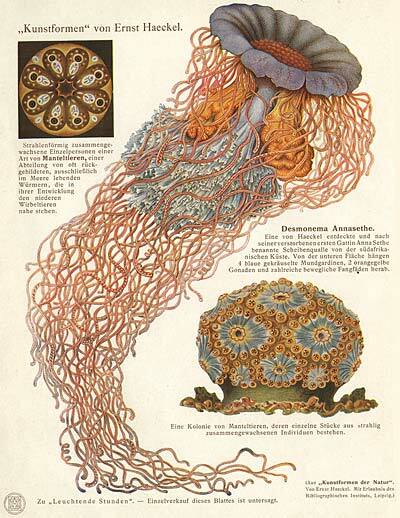 This paperback book from 1913 is a popular adaptation of Haeckel’s landmark book, Kunstformen von der Natur (Art Forms in Nature) originally published in 1904. Haeckel was a biologist and an artist, and he merged both disciplines into a study of natural forms, shapes, symmetries and patterns from every aspect of the natural world. 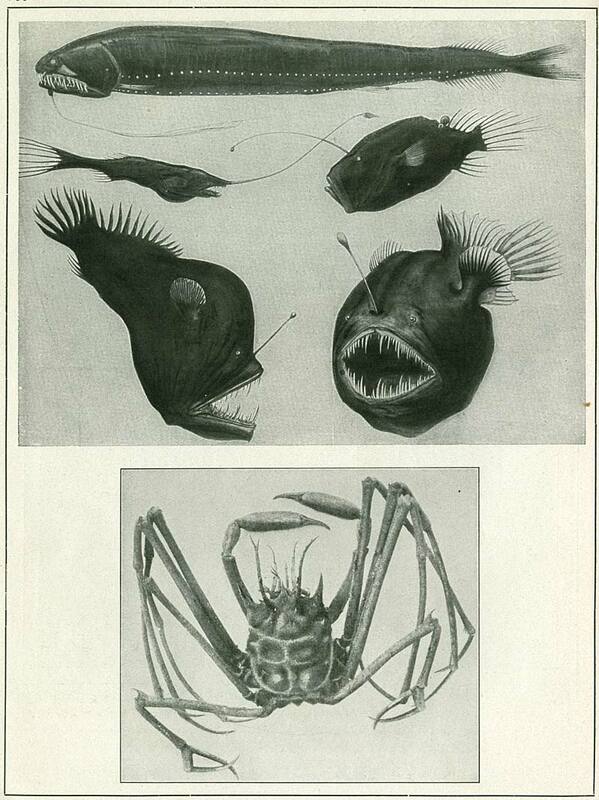 Natural history studies are beyond the scope of what we do here at Animation Resources, but this one is an exception. 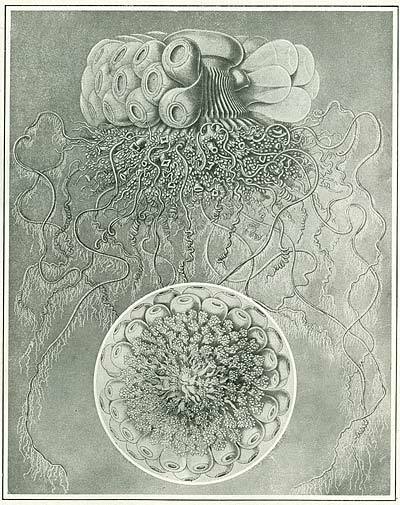 Haeckel didn’t just attempt to document lifeforms and their place in the environment… He documented the structures and shapes that are common to all plants and animals on this Earth. 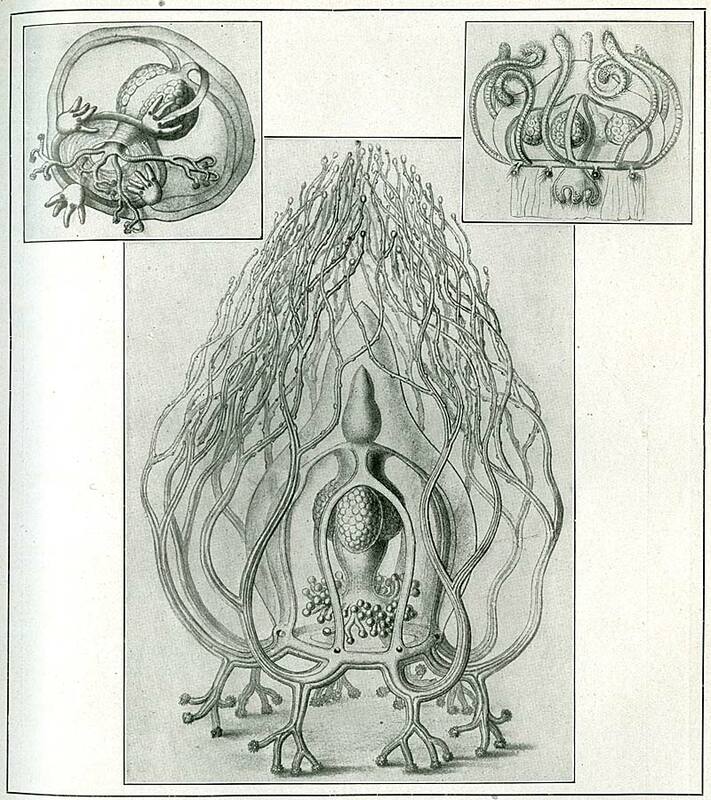 His drawings have no indication of scale or habitat of the various organisms he depicted. 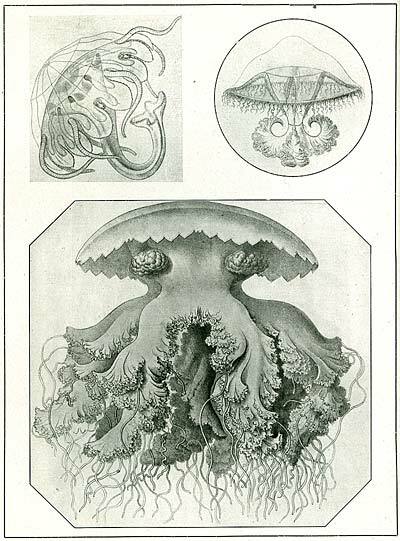 A jellyfish would appear right next to a single cell animal or the patterns of folds of skin on the face of a bat. The focus was on the form. 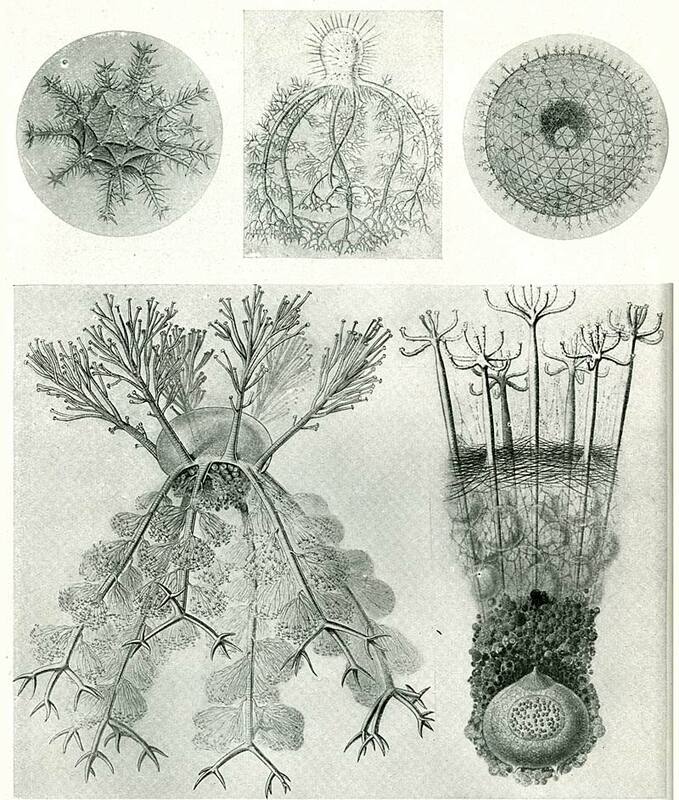 Biologists in Haeckel’s time thought of man’s place in nature much differently than we do today. 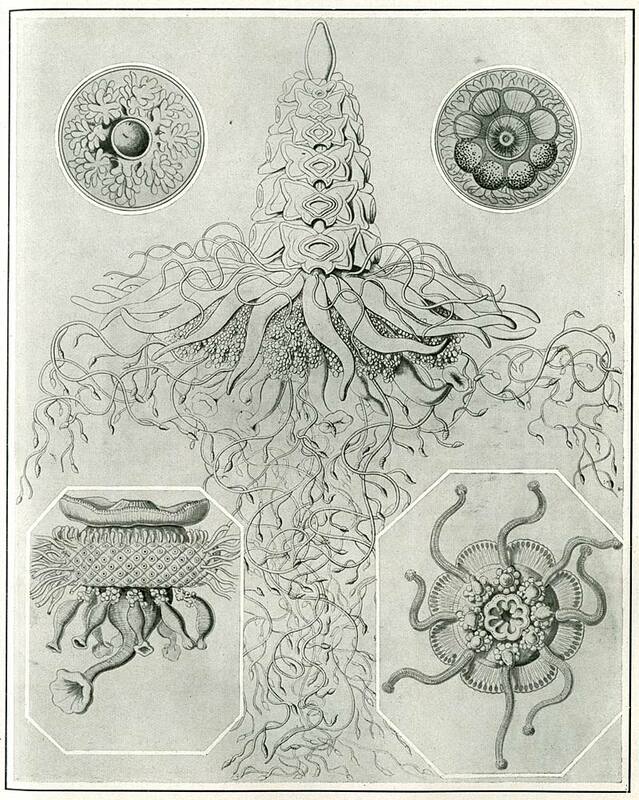 Haeckel was a staunch Darwinist. He saw mankind as a part of evolution, and a vital part of nature. Today, when we turn on the TV to watch a nature show, we see jungles and tigers, or underwater coral reefs full of fish. There isn’t a human being in sight. Many people today look upon humans as "contaminants" to the natural world. 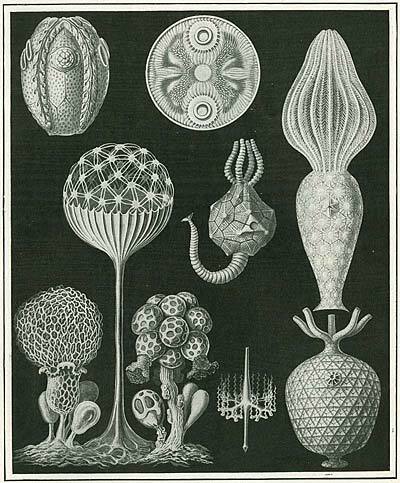 But in Haeckel’s day, nature was seen in everything- Darwin’s Theory applied to the evolution of fish or birds just as much as it applied to the evolution of people. social organizations, business practices or creative processes. 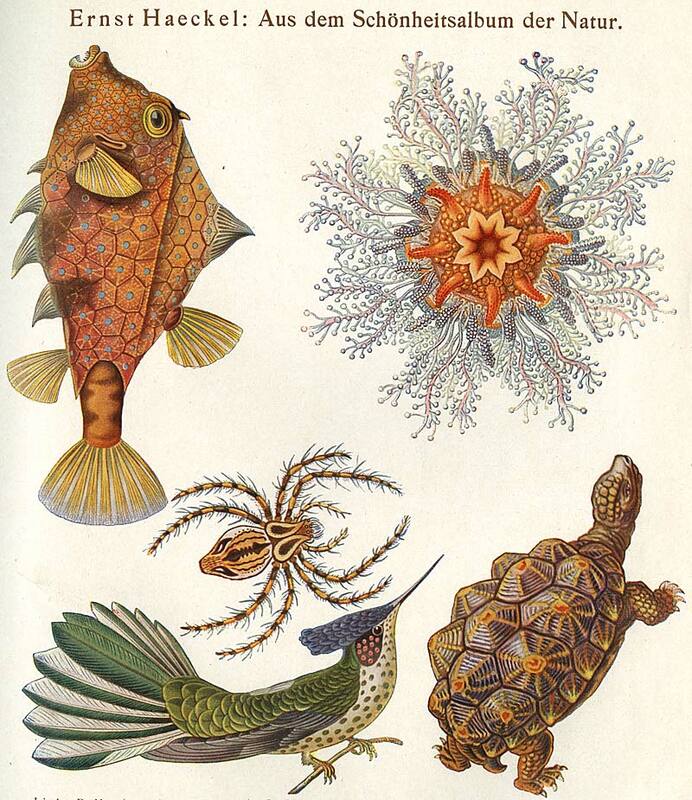 Haeckel saw no contradiction in his role as scientist/artist. 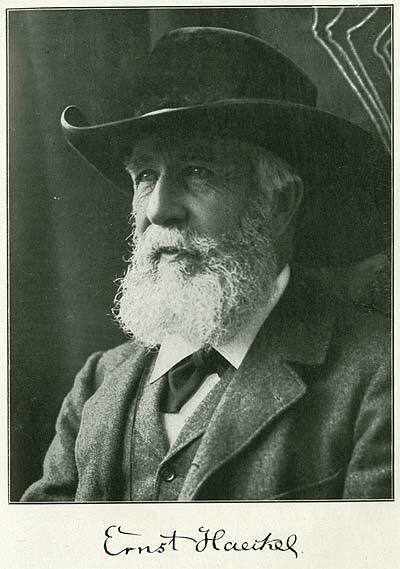 In fact, he considered his work to be an expression of his own natural place in the world he was attempting to represent. 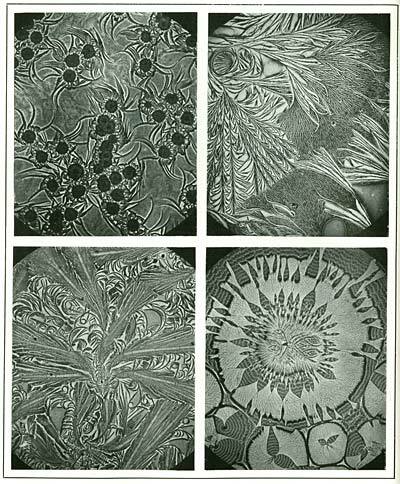 Instead of approaching the subject from an objective viewpoint, he subjectively and selectively edited what he saw to reduce it to a form that appealed to him on a basic level as an artist. 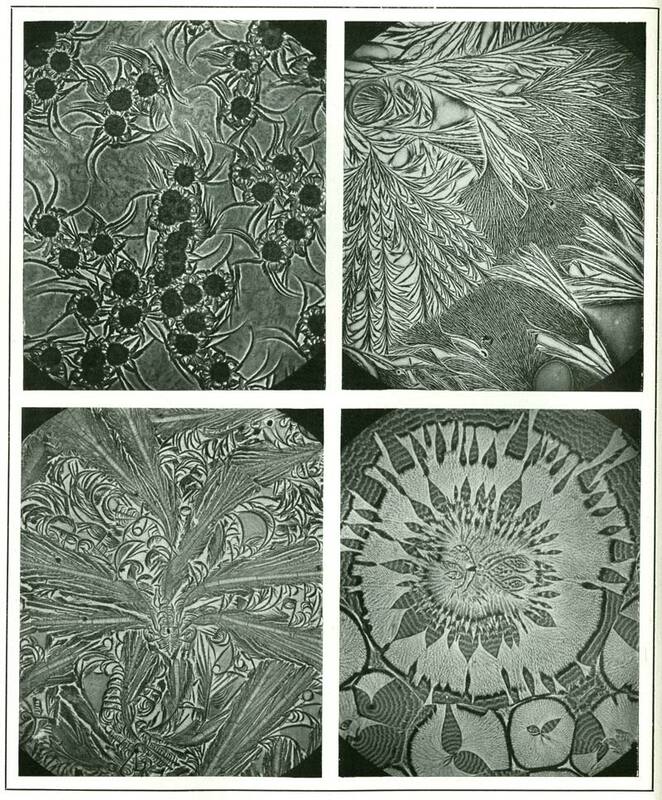 Thus, the scales of a fish become arabesques, and microscopic diatoms become beautiful sculptural forms. 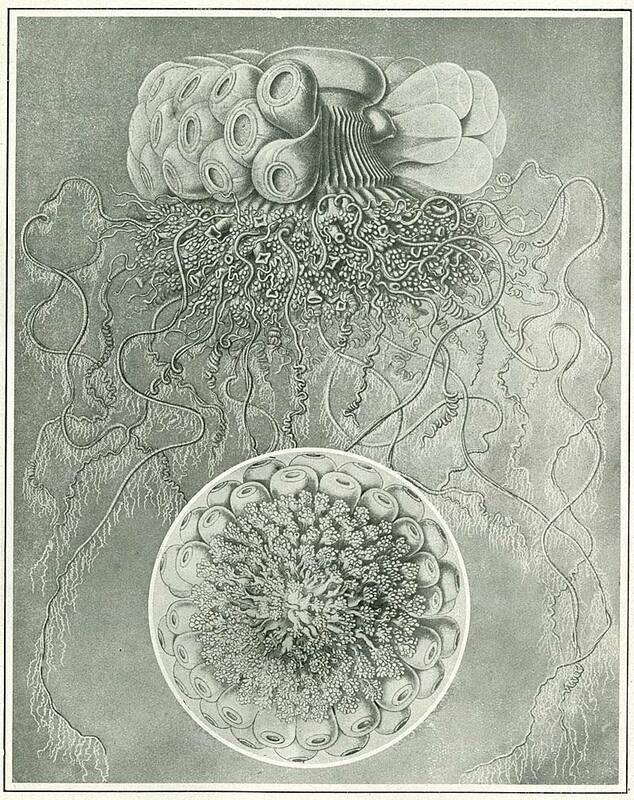 Haeckel was using nature’s imagery to express his own inner nature. 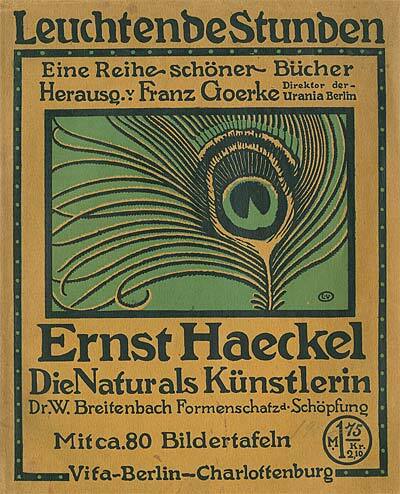 At the turn of the century, when this book was published, Art Nouveau was popular. 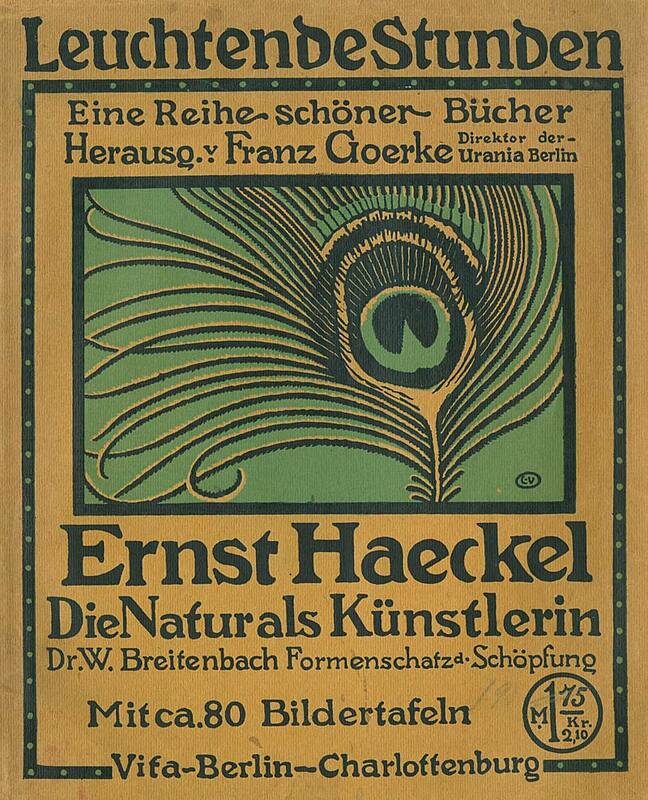 Natural forms were incorporated into everything from architecture and illustration to street signs and ornamental patterns on clothing or wallpaper. Today, we have nearly eliminated natural forms from our lives. We live in shoebox shaped houses and drive cars shaped like shoeboxes with rounded edges. We pave the landscape with geometric grids of asphalt and design characters for animation out of triangles, rectangles and circles. 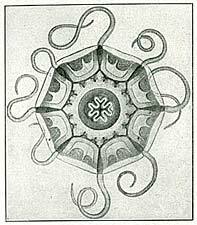 We have isolated ourselves from natural shapes; and in so doing, we have isolated ourselves from ourselves. Ernst Haeckel was a remarkable person. 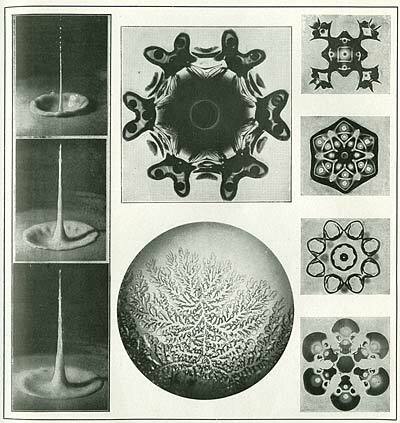 He straddled the seemingly contradictory disciplines of art and science and was able to reconcile them in a way that fully expressed the best attributes of both. 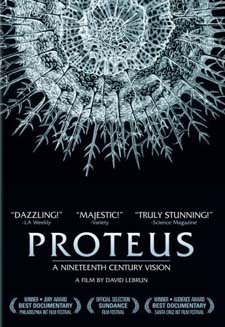 The DVD documentary, Proteus presents an amazing look into Haeckel’s life and work. 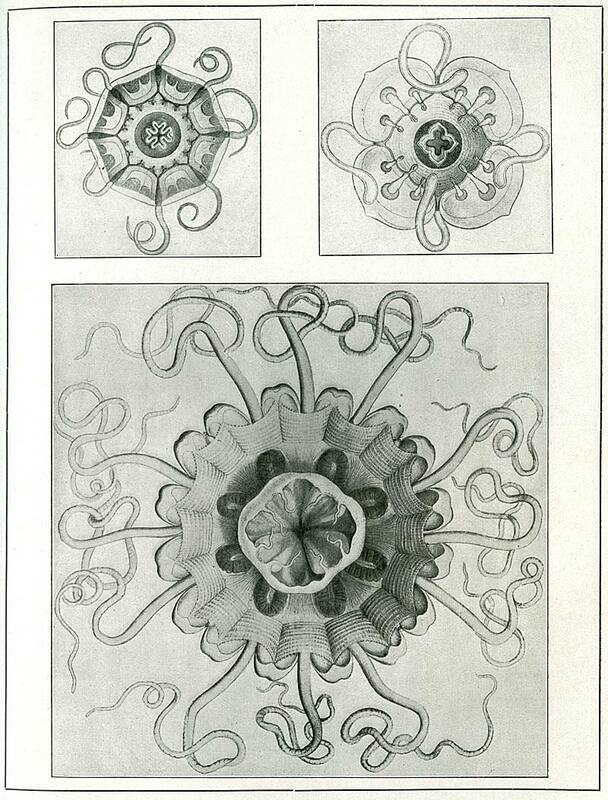 It includes eye bogglng animation based on his drawings of the remarkable single celled creature, the radiolarian. This is one of the best documentaries I have ever seen on any subject. It changed the way I think about the world around us. I can’t recommend it highly enough. I promise you, you won’t be disappointed by these books. They may just change your life! Pita, a reader of this blog sends along this link to a page with all 100 images from Haeckel’s landmark book, as well as a downloadable PDF version. Also, check out Pita’s great image blog, Agence Eureka. It’s at the top of my blogroll; and I bet once you see it, it’ll be at the top of yours too. 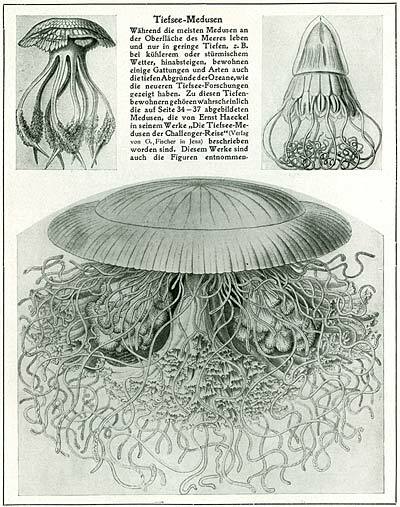 This entry was posted on Wednesday, April 25th, 2018 at 2:33 PM	and is filed under haeckel, illustration, nature, theory.